Al C. Kline, DPM is specialty and residency trained in foot and ankle surgery. Dr. Kline specializes in the correction of forefoot deformities including bunions, hammertoes, toe deformities and inherited foot deformities including soft tissue and bone disorders. He has a special interest in sports medicine of the foot and ankle. His practice is focused on providing the most conservative techniques to improve foot function and stability. We have many conservative techniques to decrease pain foot and ankle pain that may eliminate the need for surgery altogether. If surgery is required, Dr. Al Kline has over 25 years of clinical and surgical expertise to address and correct foot deformities. Dr. Kline also publishes a blog with updated procedures and techniques/news. Visit Dr. Kline’s Blog here. Dr. Al Kline was born in Amsterdam, The Netherlands. He grew up in Corpus Christi. He moved from Amsterdam to Corpus Christi, Texas in 1967. He graduated high school at W. B. Ray and attended Del Mar College. He graduated with a degree in Health Science Education. He began working for area hospitals in 1984 while enrolled in undergraduate studies at Texas A&M University (formerly Corpus Christi State University) and graduated with a bachelors in Chemistry and Biology. While studying and applying to Medical School, Dr. Kline continued to work in Corpus Christi and then moved to Houston, Texas. He worked at 3 different Houston area hospitals and a surgery center as a private surgical technician in the area of neurology, vascular surgery and total joint replacement surgery. Still in his early 20’s, it was during this period that he ran for Reebok Racing Team in Houston, Texas considering a professional career in sports. He took a special interest in sports medicine and began working closely with residents of both orthopedics and podiatry in the Houston area. He then applied to various medical and podiatry schools in the United States. He was accepted to the Temple School of Podiatric Medicine in Philadelphia, Pennsylvania. It was also during this time, that Dr. Kline met his wife Joann while living in Philadelphia. She also attended the Temple School of Podiatric Medicine. They were married in their second year of studies and began their family while still living in Philadelphia. After graduation, they moved to Ft. Worth, Texas where Dr. Al Kline completed a medical and surgical residency in foot and ankle surgery at John Peter Smith Hospital. In Ft. Worth, while starting a young family, Dr. Joann Kline started a Podiatric Home Health Care service. This was the first of its kind. This business model was passed on to the JPS Podiatry Residents. They moved to Corpus Christi in 1994 to start their practice. 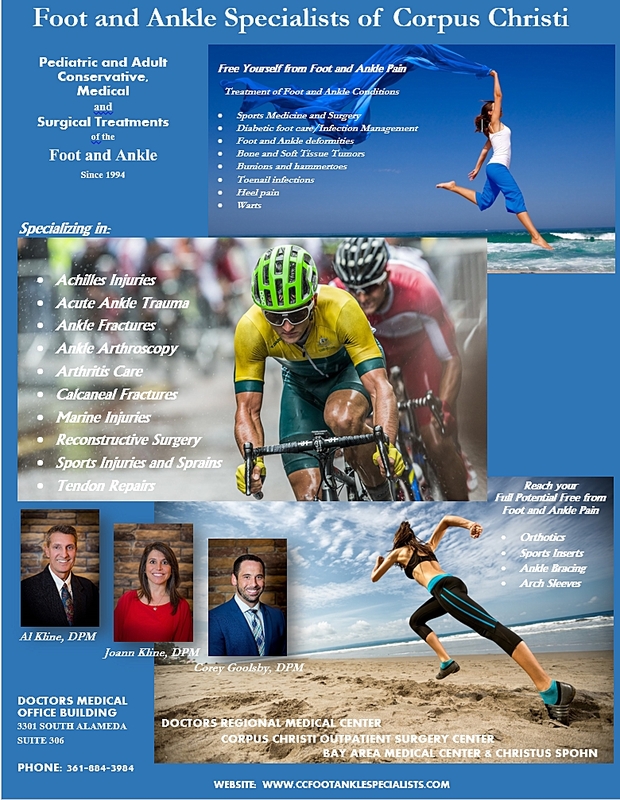 The FAOJ is a peer reviewed journal written for and by podiatric foot and ankle surgeons and other health care professionals dedicated to providing a high quality publication of foot and ankle related articles, free of charge on the internet. In 2011, the FAOJ became the official publication of the International Foot and Ankle Foundation for education and research. Our primary goal is to educate, inform and bring together various specialties in the study of foot and ankle medicine and surgery. Dr. Kline stepped down as chief editor to provide more time to his practice. Dr. Gary Dockery, DPM, FACFAS is now acting chief editor. Many articles published on this site come from a variety of sources including private practice, residency programs and hospital institutions. We are actively looking for research articles and case presentations relevant to podiatry and foot orthopedics for open-access publishing. Articles were published on a monthly basis from 2008 through November 2013. In 2014, the journal went to a quarterly publishing schedule. Dr. Al Kline has authored and published a number of articles for well known magazines and books. He has also written a number of articles before authoring the Foot and Ankle Journal and writing over 60 + articles related to foot and ankle conditions. Here are just a few of his authored articles. Dr. Kline ran for Reebok Racing Team while an undergraduate student competing both in the United States and internationally. After graduating and attending residency, he quit running and began cycling competitively. He participates and races as a Masters cyclist. Doctor Kline lives in Corpus Christi with his wife, Joann Kline DPM. They have four children.